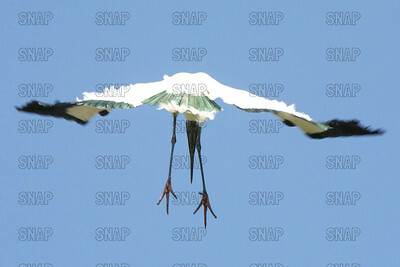 A Wood Stork (Mycteria americana) in Florida flapping its wings. Wood Storks are also known as a Wood Ibis, Ironhead, Flinthead, Gourdhead, Gannet, Preacher, Spanish Buzzard, Colorado Turkey, or Wood-pelican. 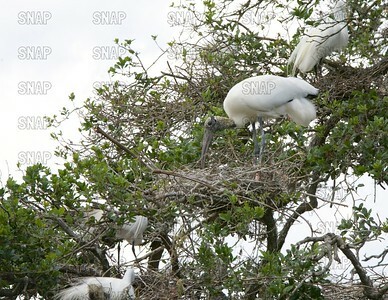 Wood Storks (Mycteria americana) and Great Egrets (Ardea alba) nesting. There is a pecking order in rookeries, and the larger birds (Wood Storks) choose the higher nesting places. 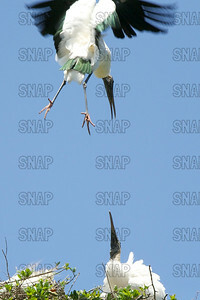 A Wood Storks (Mycteria americana) in a bill snapping mating ritual. 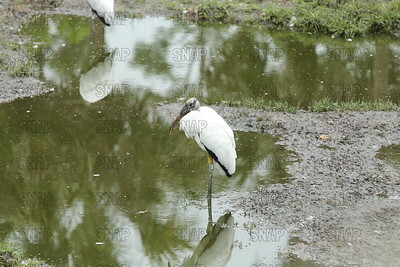 Wood Storks are also known as a American Wood Stork, Wood Ibis, Ironhead, Flinthead, Gourdhead, Gannet, Preacher, Spanish Buzzard, Colorado Turkey, or Wood-pelican. 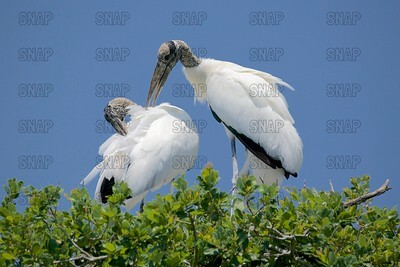 A Wood Storks (Mycteria americana) mating in Florida. 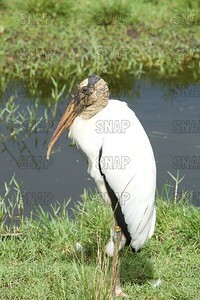 Wood Storks are also known as a Wood Ibis, Ironhead, Flinthead, Gourdhead, Gannet, Preacher, Spanish Buzzard, Colorado Turkey, or Wood-pelican. 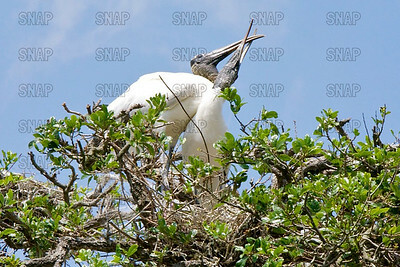 A pair of Wood Storks (Mycteria americana) tend to their nest. Wood Storks are also known as a American Wood Stork, Wood Ibis, Ironhead, Flinthead, Gourdhead, Gannet, Preacher, Spanish Buzzard, Colorado Turkey, or Wood-pelican. 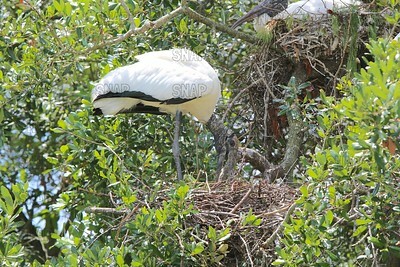 A Wood Stork (Mycteria americana) tend to their nest. 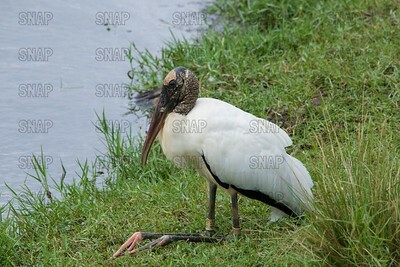 Wood Storks are also known as a American Wood Stork, Wood Ibis, Ironhead, Flinthead, Gourdhead, Gannet, Preacher, Spanish Buzzard, Colorado Turkey, or Wood-pelican. 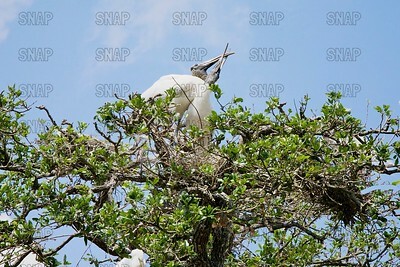 A Wood Stork (Mycteria americana) tending to its nest. 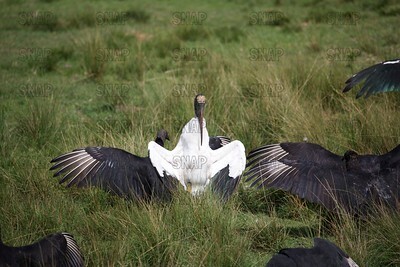 Wood Storks are also known as a American Wood Stork, Wood Ibis, Ironhead, Flinthead, Gourdhead, Gannet, Preacher, Spanish Buzzard, Colorado Turkey, or Wood-pelican. 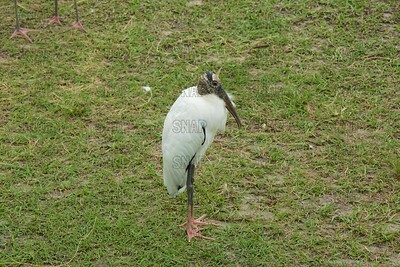 A Wood Stork (Mycteria americana) preens its feathers. 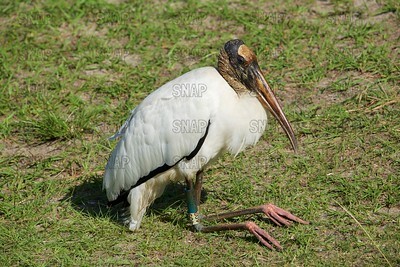 Wood Storks are also known as a American Wood Stork, Wood Ibis, Ironhead, Flinthead, Gourdhead, Gannet, Preacher, Spanish Buzzard, Colorado Turkey, or Wood-pelican. 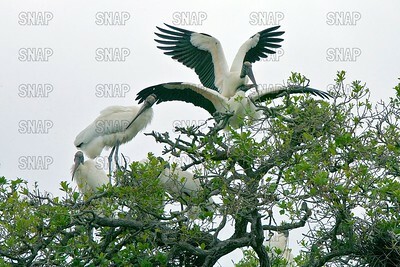 A Wood Storks (Mycteria americana) foraging for food. 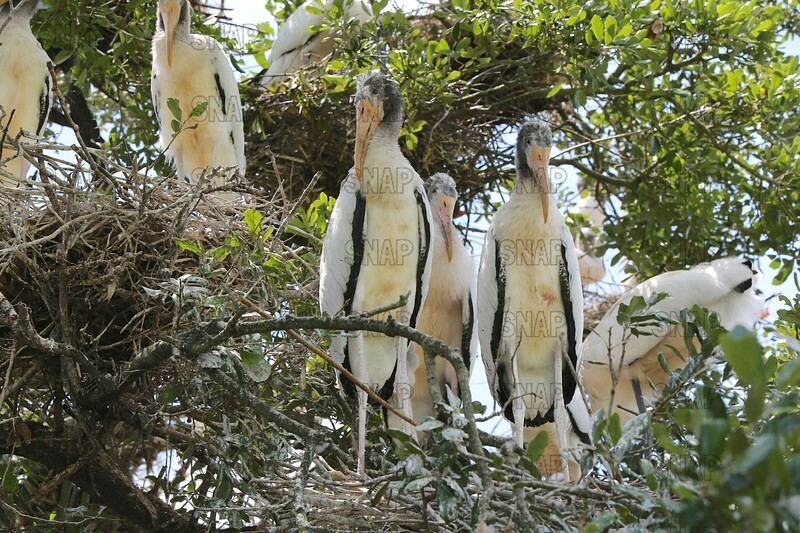 Wood Storks are also known as a American Wood Stork, Wood Ibis, Ironhead, Flinthead, Gourdhead, Gannet, Preacher, Spanish Buzzard, Colorado Turkey, or Wood-pelican. 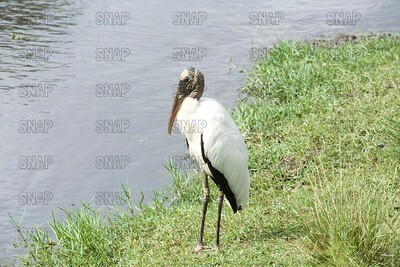 A Wood Stork (Mycteria americana) standing near a wetland. Wood Storks are also known as a American Wood Stork, Wood Ibis, Ironhead, Flinthead, Gourdhead, Gannet, Preacher, Spanish Buzzard, Colorado Turkey, or Wood-pelican. 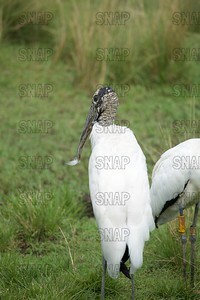 A Wood Storks (Mycteria americana) foraging for food. Note that this bird has been banded. Wood Storks are also known as a American Wood Stork, Wood Ibis, Ironhead, Flinthead, Gourdhead, Gannet, Preacher, Spanish Buzzard, Colorado Turkey, or Wood-pelican. 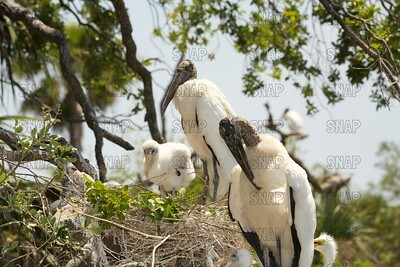 A few adult Wood Stork (Mycteria americana) looks over many fledglings. Wood Storks are also known as a American Wood Stork, Wood Ibis, Ironhead, Flinthead, Gourdhead, Gannet, Preacher, Spanish Buzzard, Colorado Turkey, or Wood-pelican. 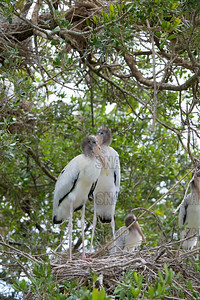 Wood Stork (Mycteria americana) fledglings awaiting their parents to return with food. 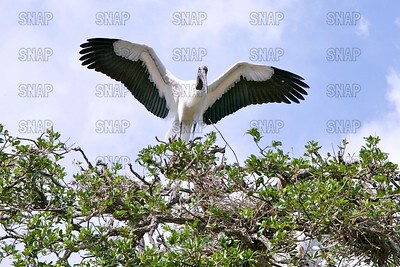 Wood Storks are also known as a American Wood Stork, Wood Ibis, Ironhead, Flinthead, Gourdhead, Gannet, Preacher, Spanish Buzzard, Colorado Turkey, or Wood-pelican. 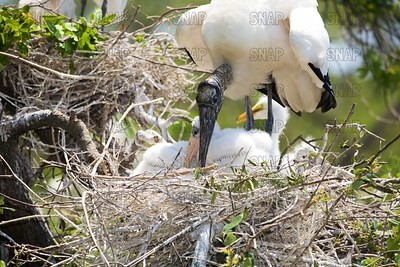 A Wood Storks (Mycteria americana) brings a twin to add to a nest. 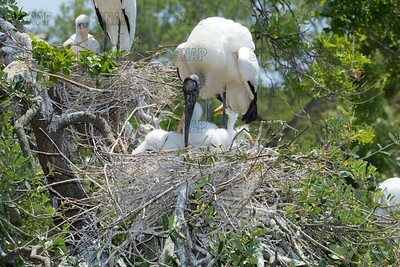 A pair of Wood Storks (Mycteria americana) build a nest. 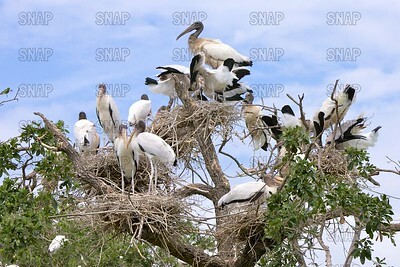 Wood Storks (Mycteria americana) nesting in a tree top. Young nestling Wood Storks (Mycteria americana). 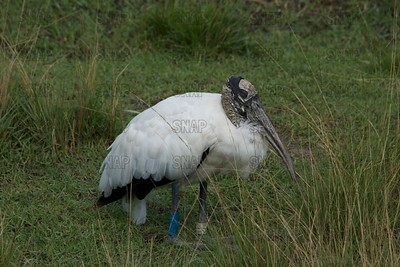 A Wood Stork (Mycteria americana) incubates eggs. Wood Storks (Mycteria americana) cross and clasp each others bills during courtship. 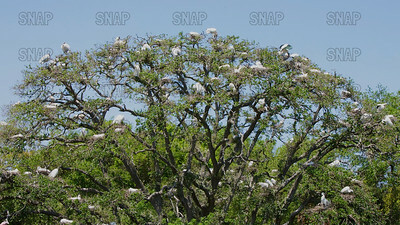 A tree full of Wood Stork (Mycteria americana) nests and St. Augustine, Florida. 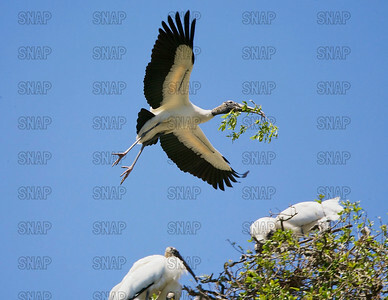 A Wood Stork (Mycteria americana) glides to its nest. 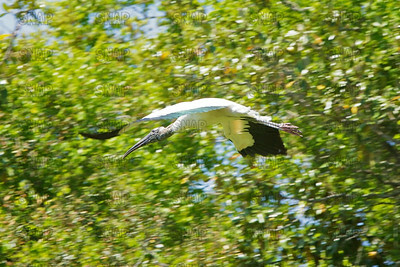 A Wood Stork (Mycteria americana) comes in for a landing. 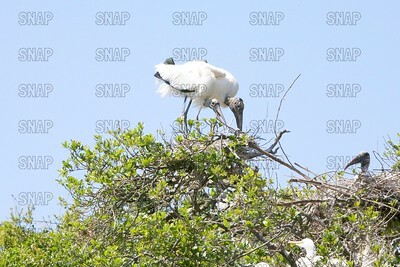 A Wood Stork (Mycteria americana) lands in its nest. 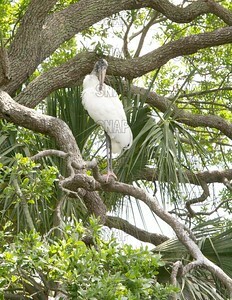 Adult Wood Stork (Mycteria americana) resting. 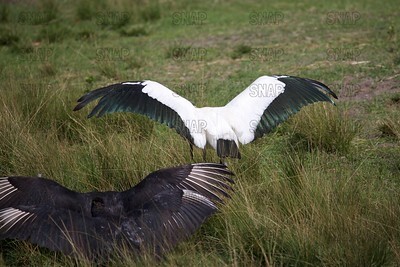 Black Vulture and a Wood Stork. 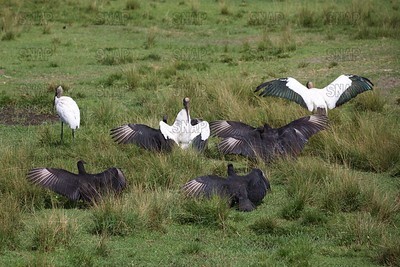 A Black Vulture (Coragyps atratus) in the foreground, and a Wood Stork (Mycteria americana). 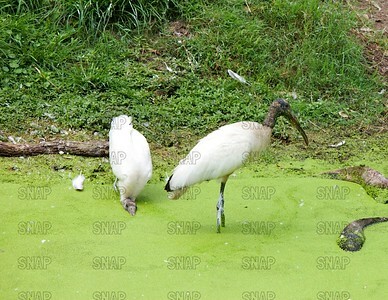 Immature Wood Stork facing camera (Mycteria americana), and flanked by two other Wood Storks. The dark birds are Black Vultures, also known as American Black Vultures (Coragyps atratus). Immature Wood Stork facing the camera (Mycteria americana), and the other birds are Black Vultures (Coragyps atratus), also known as American Black Vultures. They are all sunning themselves. 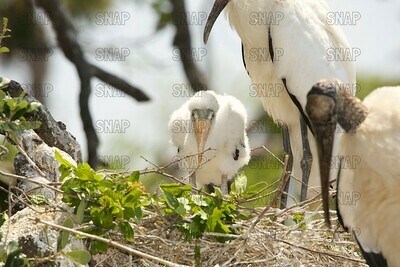 A Wood Stork (Mycteria americana) watching over its nestlings. Wood Storks are also known as a American Wood Stork, Wood Ibis, Ironhead, Flinthead, Gourdhead, Gannet, Preacher, Spanish Buzzard, Colorado Turkey, or Wood-pelican. A pair of Wood Storks (Mycteria americana) preening. 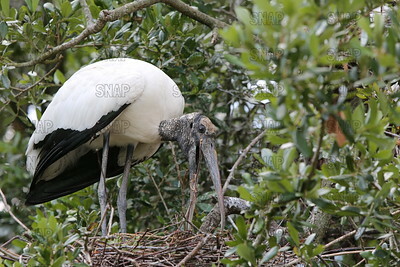 Wood Storks are also known as American Wood Stork, Wood Ibis, Ironhead, Flinthead, Gourdhead, Gannet, Preacher, Spanish Buzzard, Colorado Turkey, or Wood-pelican.